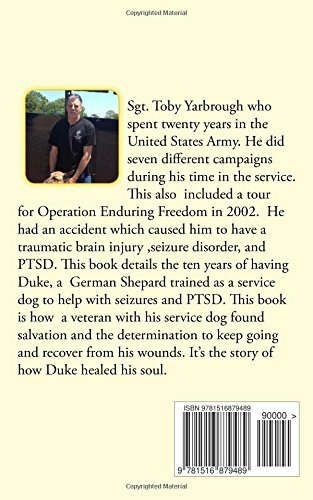 I'm naturally drawn to stories about animals, which made Duke: The Dog That Saved My Life by Toby Yarbrough a natural read for me. The synopsis about this book drew me right away. Toby Yarbrough is an Army Veteran with twenty years of military service. His life was changed during his service to his country, America. Duke: The Dog That Save My Life is the result of that fateful day of September 11, 2001. It was a day of infamy for many, but personally for this author who was injured and disabled due to an accident he sustained while deployed to Afghanistan. Considering what happened to him, Toby was lucky to be alive. Enjoy the story and feel the strong emotions of the author and his special bond with his service dog, Duke. Toby Yarbrough saw war. He has been to hell and back but retained his optimism and his sense of self, despite post-traumatic stress disorder, and seizures as a result of the accident he endured. For those that don't know, PSTD isn't a simple psychological disorder. It isn't a defect of the mind. In fact, it really doesn't have anything to do with simple "stress". PTSD is a real, long-lasting, permanent residue of trauma, psychological and/or physical. There is no cure. It never goes away. "It makes you feel stressed and afraid even long after the danger is long gone. You have a hard time functioning in normal life." A person with PSTD will never be the person they once were. No amount of therapy, counseling or drugs can make you "all better". I know a little about PTSD from doing research, but nothing I read before matched the information I received in reading this book. 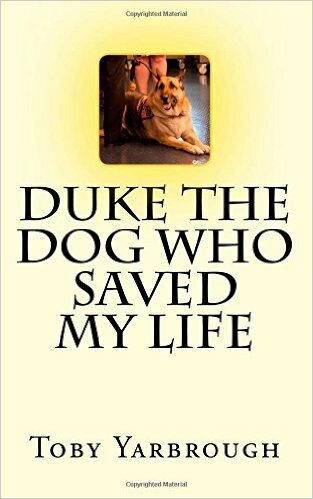 Duke: The Dog that save my life is written as a journal, a personal memoir filled with colorful photos. It's a wonderful, touching, fast and easy reading book that anyone can enjoy. I particularly enjoyed the chapter from Duke's point of view. It’s a book about a disabled Army veteran named Sgt. Toby Yarbrough and his service dog, Duke, the dog that saved his life on more than one occasion. I had no idea what our military service person actually endured during wartime. How could I? How could anyone unless they were there? I had no idea what having/training a service dog entailed. Now I do. I highly recommend this book to any military veteran, animal lover, and especially to friends and family of a veteran. Most importantly, I strongly believe that every world leader and their cabinets should read this book, because 1) service dogs are important part of a Veteran's healing process and should be provided to every disabled veteran that needs one, and 2) Most importantly they need to realize that war is not always the right answer because some wounds will never heal. This is a memorable story of a Veteran & a dog named Duke that keeps him going! Everyone should read it! Thank you Toby and Duke for your service! Disclaimer: I received an e-book from Reader’s Favorite in exchange for a fair and honest review. Until next review, stay safe. Smile! Show compassion to others. Be nice to one another. Read a book and pass it on. Review it. Reviews are very important tool for authors. Cheers! In Shattered Lies: "It's All About Family." Now available from Black Opal Books at all on-line retailers and independent bookstores. "Some secrets should remain that way." And now for some legal stuff: Copyright 2016 by S.J. Francis. Opinions expressed here are solely those of the author, S. J. Francis and are meant to entertain, inform and enlighten, and intend to offend no one.